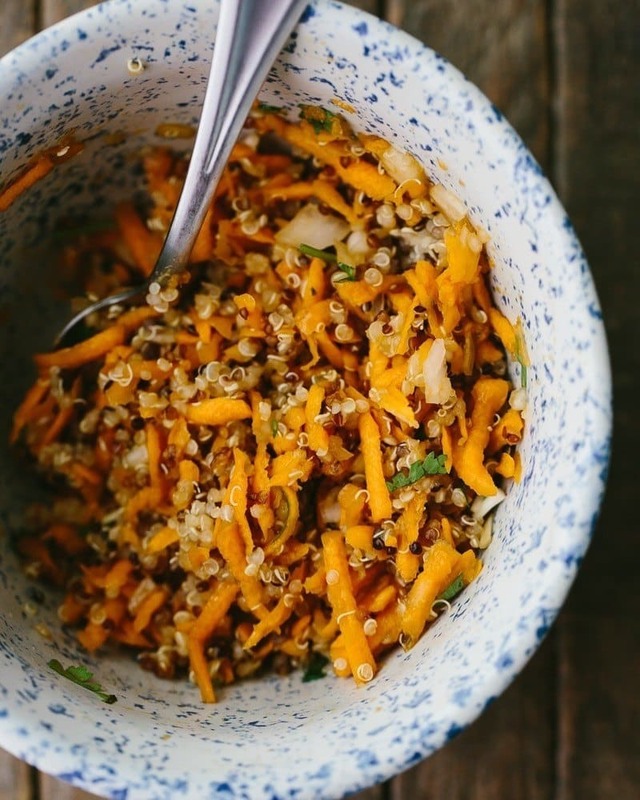 Ginger Carrot Salad with Quinoa | Naturally. On occasion, one fail in the kitchen can turn into something very unexpected. Take for example, this salad. The shredded carrots started at as a filling for a stuffed pepper. My goal had been to have a breakfast pepper, complete with a baked egg. I tried and tried but the results were always the same- a tough egg yolk. I hated it but I had all of this shredded carrot mixture leftover at which point, I added it to lettuce and called it a day. I’ve since eaten this carrot salad nearly every day for lunch and I don’t regret not getting the pepper to work. 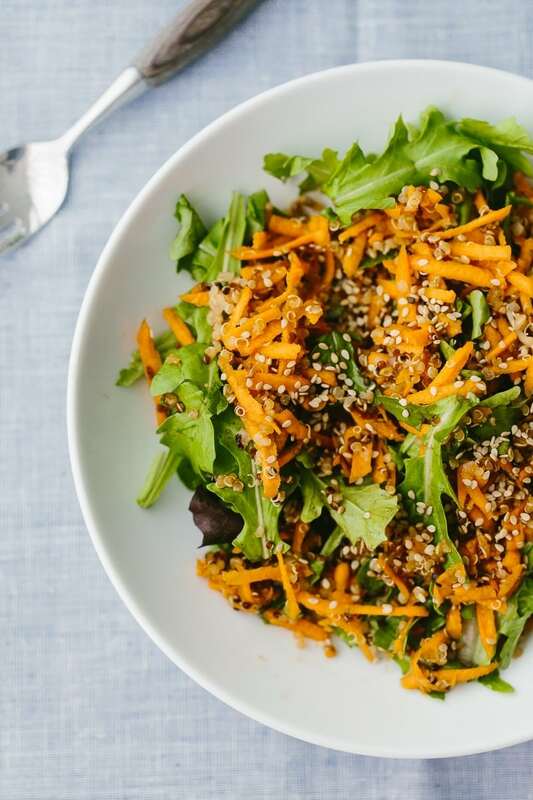 The best part in my mind: if you are using quinoa leftovers, this salad comes together in 5 minutes (and while I recommend you let it sit for a bit, it could really be eaten right away.) 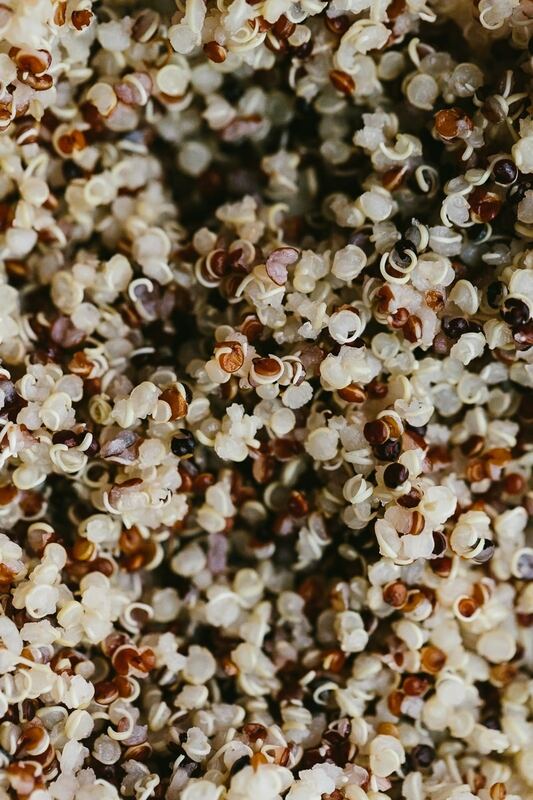 But, even if you don’t have extra quinoa sitting around- it’s such a quick cooking grain that it still keeps this meal quick. As I’ve been doing these pairings, I’ve realized the lack of quick and simple side dishes on the site. This salad is another attempt to make up for that. I can easily eat this for lunch every day, with a few beans thrown on top (or if you’re a tofu fan, I think fried tofu would be wonderful here as well). However, I think it makes for a great dinner companion. App: Potstickers. When I’m going to use soy sauce (or bragg amino acid), I’m going to use it. I’ve also been known to just eat salad and potstickers for an entire meal. Main: Really this salad would work well for most main dishes but I’ve found I love it in place of slaw next to a good veggie burger. 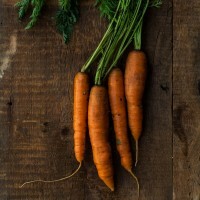 In a small, combine the shredded carrots, cooked quinoa, and scallions. In a separate bowl, whisk together the tamari, rice wine vinegar, ginger, and honey. Pour over the carrot mixture and toss until well combined. Let sit for 20 minutes. Lovely recipe for the beginning of fall! Yum! My favourite kind of lunch. i have tried making Moroccan salad from Faith’s blog long time ago but this one looks so good…i have to try it as i have some shredded carrot left too. What a fortuitous accident. 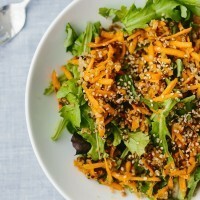 This salad looks clean and bright and tasty- a perfect lunch. May you one day perfect breakfasts stuffed peppers. Carrot and ginger is such a great combination. And personally, I think that potstickers and salad make a perfectly fine meal! 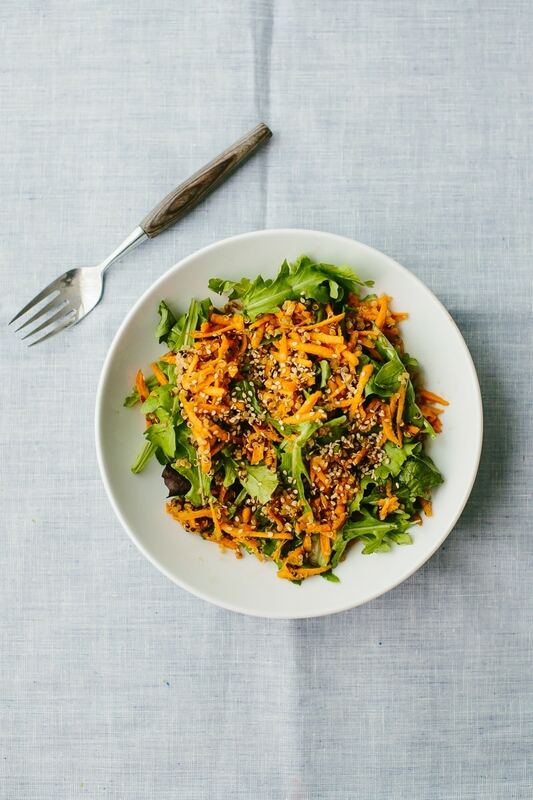 Another proof that delicious doesn’t have to be complicated – super simple yet super delicious salad! It doesn’t hurt that it looks gorgeous, too! Quinoa is my new favorite food. I tried it for the first time this summer and I can’t get enough of it. I wonder, could you use coconut aminos in place of the tamari? I’ve not tried it but I think it would work just fine!